Up for making a few waves in your recreational life? 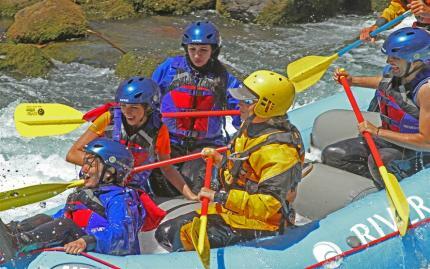 Gear up and hit the Clackamas River during this whitewater romp! 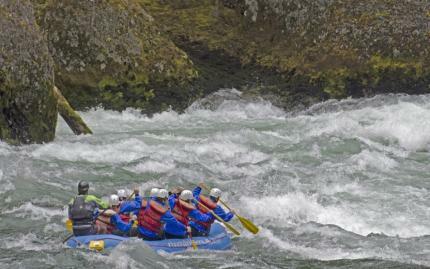 You'll set out with an experienced guide and soon find yourself immersed in back-to-back Class III rapids that will leave you breathless! Interspersed along the way are numerous pools, which offer time to take in the surreal scenery rising all around you. Midway through your adventure, you'll stop to relax riverside and enjoy a picnic lunch. The Clackamas River cuts through the Cascade Mountains, where it has carved an impressive gorge out of basalt rock. All this sets the scene for what should be a pretty wild ride. Note: For safety purposes, pregnant women are not allowed to join this activity. A $15/person cancellation fee will be assessed on any cancellation. Cancellations made within 72 hours prior to trip departure will forfeit 50% of the total trip price. However, you may substitute another person, with no penalty or you may transfer the trip to another date.